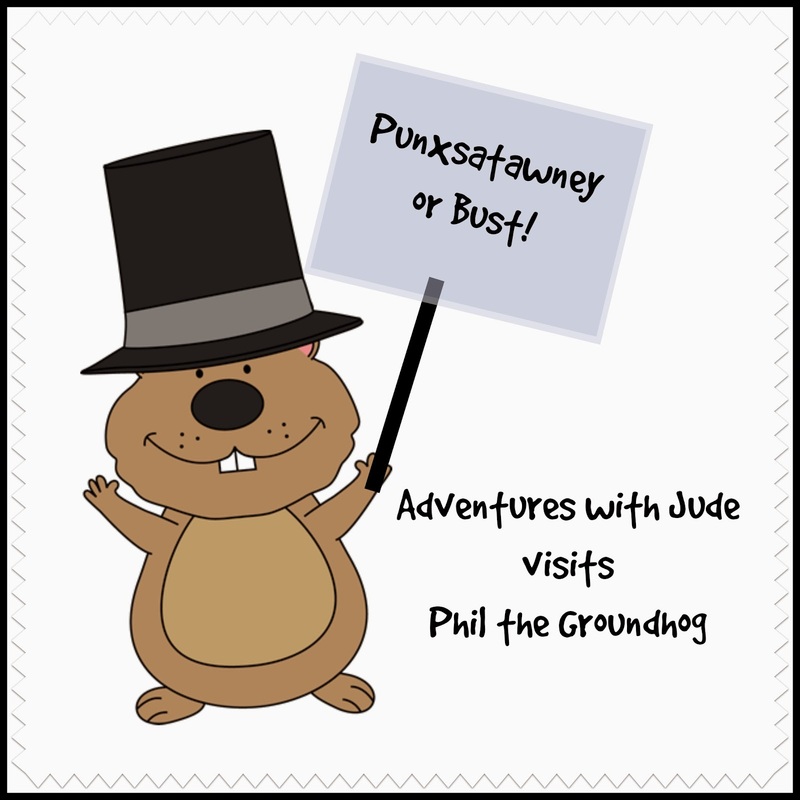 Adventures with Jude: Visiting Phil: Punxsutawney or Bust! 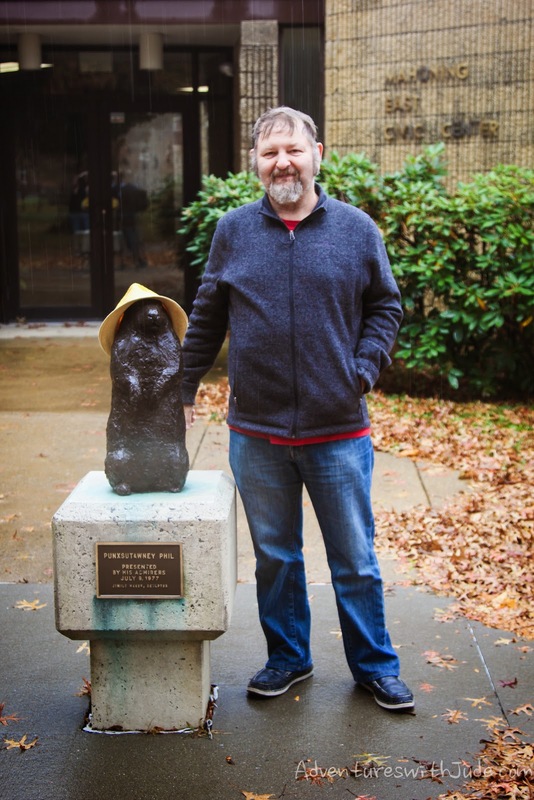 Visiting Phil: Punxsutawney or Bust! Last spring, our Aussie family told us they were planning a trip to the states, and would be able to spend three weeks with us. I was so excited, because we hadn't seen each other since 2000. They still wanted to see a bit of the eastern US, so we sat down and discussed where we wanted to go together. Jo and I looked at maps and driving times to see how much we could fit in, and Brendan kept tossing ideas out. On their must-see list was Niagara Falls, and a few clicks later, we had it planned. Then Brendan asked if we could go to Edmonton, since we were already in Canada. Um...Canada is pretty big, and the cities were nowhere near each other. That was a resounding no. Eventually Jo and I had added Fort Erie, Ontario, the Rock and Roll Hall of Fame in Cleveland Ohio. and Gettysburg PA to our itinerary, but Brendan kept throwing random towns at us - I think by then he was trying to drive us batty. Then he demanded "What about Phil? Can we see the groundhog?" 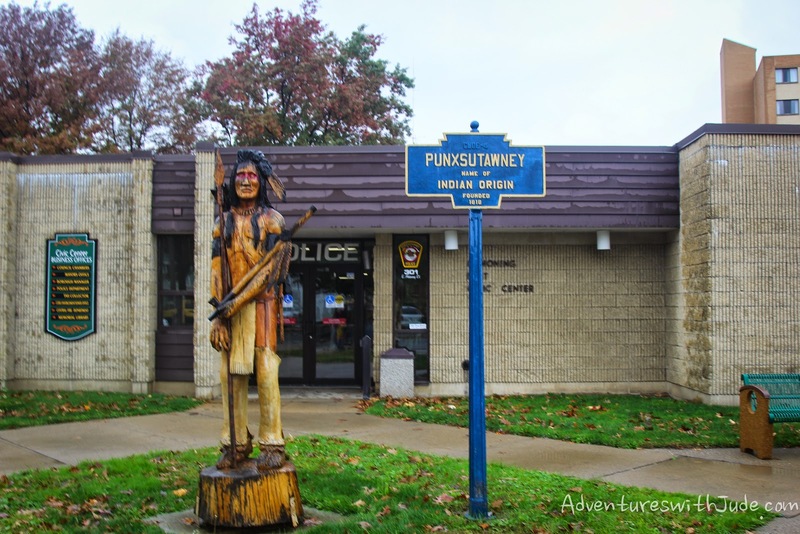 A few more clicks and we realized that Punxsutawney actually was not far off our planned Cleveland, OH - Fredrick, MD route. We were wondering what on earth we would do there...after all, it was October, not February. Sure enough, there was a small Chamber of Commerce (with gift shop! ), and we found out Phil (and his Missus, Phyllis) lived in a burrow at the town library, so we figured we'd get to peek at him, get a T-shirt, and move on. We had timed out the trip from Cleveland and determined that if nothing else, it would make for a fun lunch stop on our route. 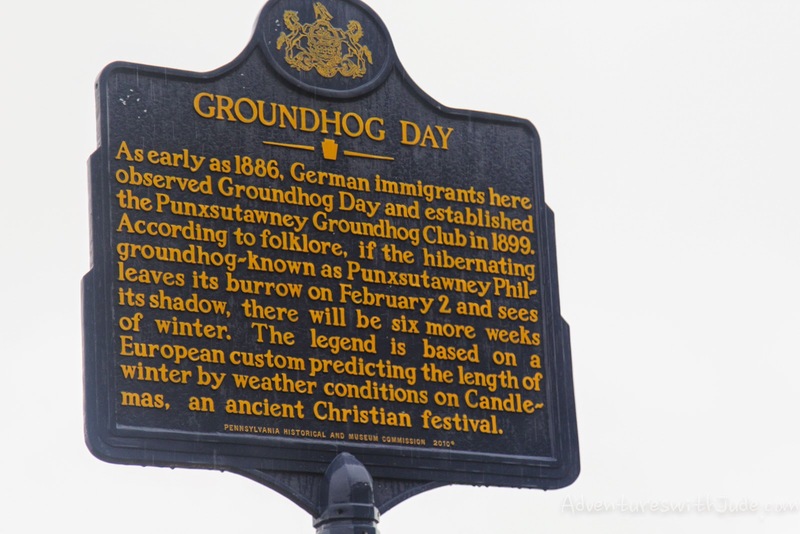 We didn't think we'd have so much fun - we were just happy to get a good laugh out of the absurd idea that Jo and Brendan were going to travel all the way from Canberra, the capital of Australia, to Punxsutawney, PA, the self-proclaimed "Weather Capital of the World." Brendan declared the decision made: Punxsutawney or bust! 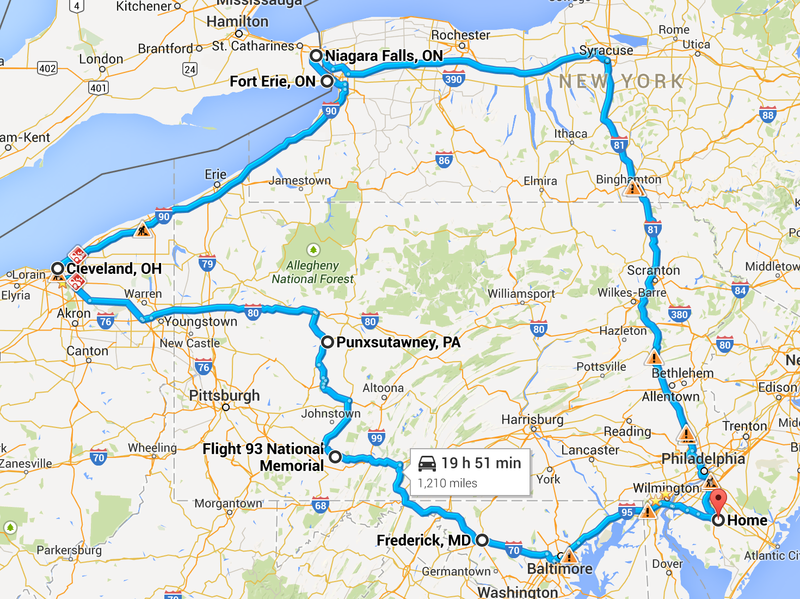 We left our hotel in Cleveland around 8:30 am and headed southeast. 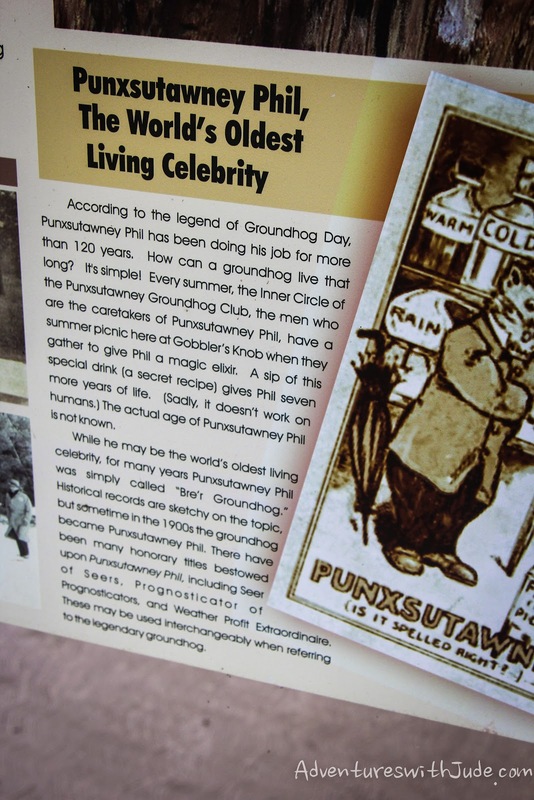 We figured it would take us just under 4 hours, putting us in Punxsutawney around lunchtime. The only real problem we ran into was rain. It absolutely poured buckets as we came across I-80, slowing us at points to practically a crawl (there were a few times I wished we could have pulled off, but it was so bad that it was safer to keep moving than risk stopping and being rear-ended). We finally seemed to outrun the storm, and wended our way around the back roads to Gobblers' Knob, on the outskirts of Punxsutawney. 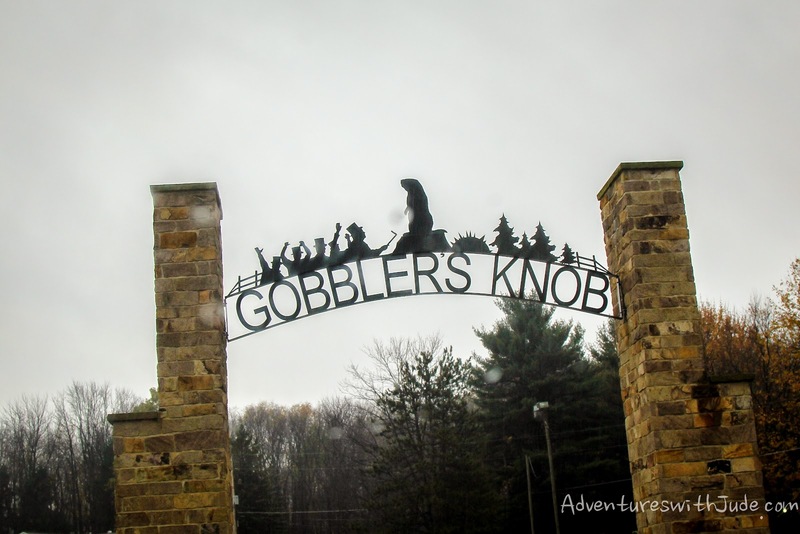 We pulled into Gobbler's Knob, and hopped out to take some photos. And then the rain caught up to us! 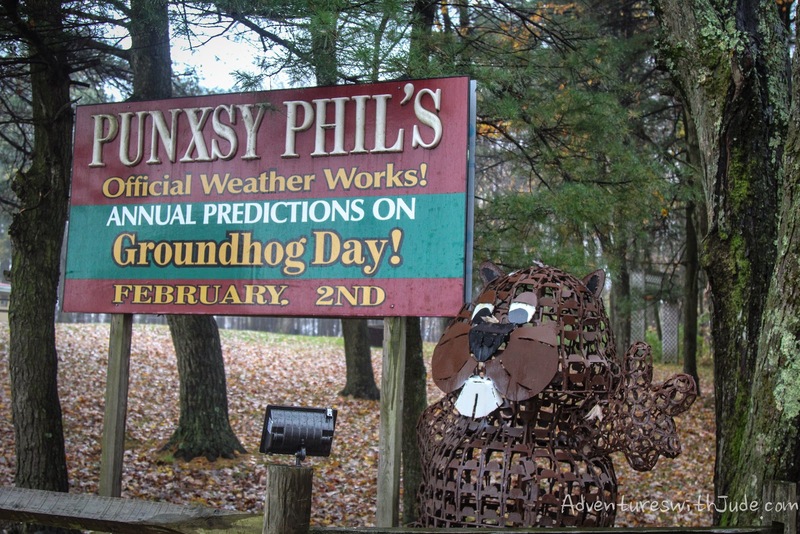 I took this photo from the car - it was raining too hard to go up closer to Phil's stump, where he announces each February 2nd whether there will be six more weeks of winter or an early spring. 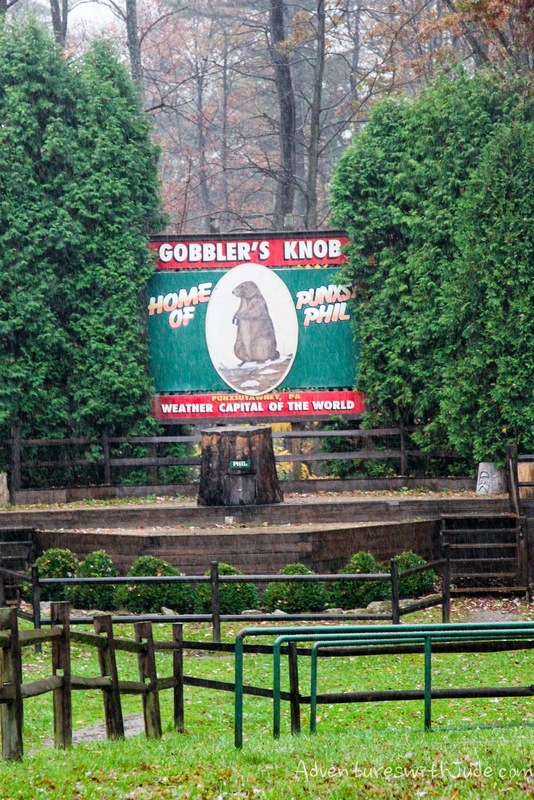 We did find out a bit of history about Gobbler's Knob and Phil. 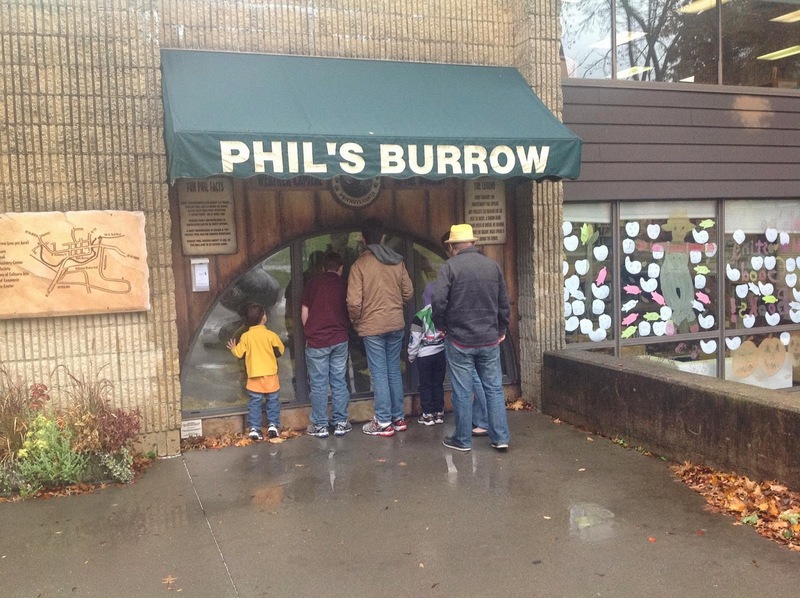 The Chamber of Commerce/Gift Shop is located at one end of Mahoney Street, while Phil's burrow is at the opposite end. It was an adorable shop. 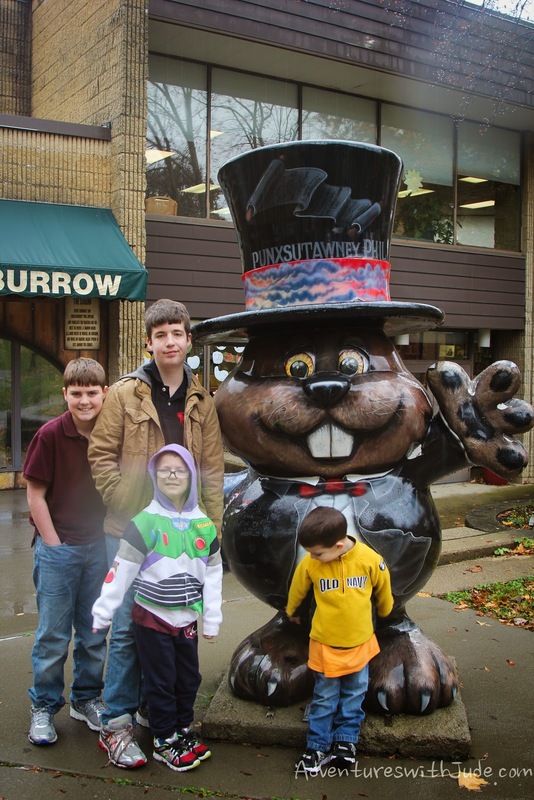 Sure, there were the requisite T-shirts, coffee mugs, and plushy groundhog toys, but there was also a small-town charm. Many items were locally handmade, and offerings included several different town- and church-sponsored "Community Favorites" cookbooks. The lady working at the shop was very friendly, and happy to share what the town is really like on Groundhog Day. There is no parking at Gobblers Knob, so buses - some staged from nearby, some filled with tourists who have driven up to 12 hours - disgorge their passengers at the Knob, or people staying at local B&Bs walk out. (It's about 2 miles outside of the town.) Visitors start arriving as early as 2 am for the pre-dawn revelry, and Phil makes his appearance around 7:30 am. 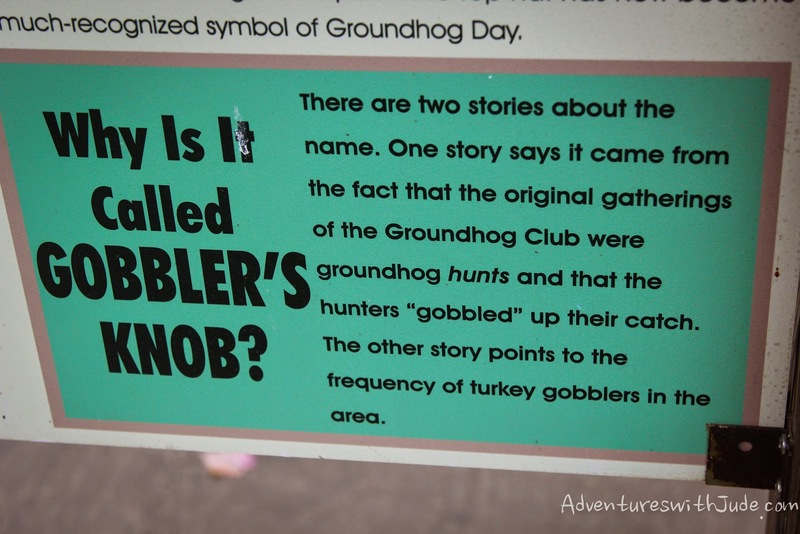 Soon after Phil leaves Gobblers Knob and returns to his burrow, so do the people return to theirs. By about 2 pm, the town is emptied out. Note: The town is cute and has a small-village feel, but it definitely doesn't look like what you see in the 1993 movie Groundhog Day. The movie was actually filmed outside of Chicago, IL! Had the weather been better, we'd have walked between the shop and the Library (it's only about 2 blocks), but since every time we tried to get out of the car it poured, we decided to drive. Phil and his Missus are well-guarded. The community's police station is attached to the library, where the Groundhogs live. When we arrived Phil was rather sleepy. 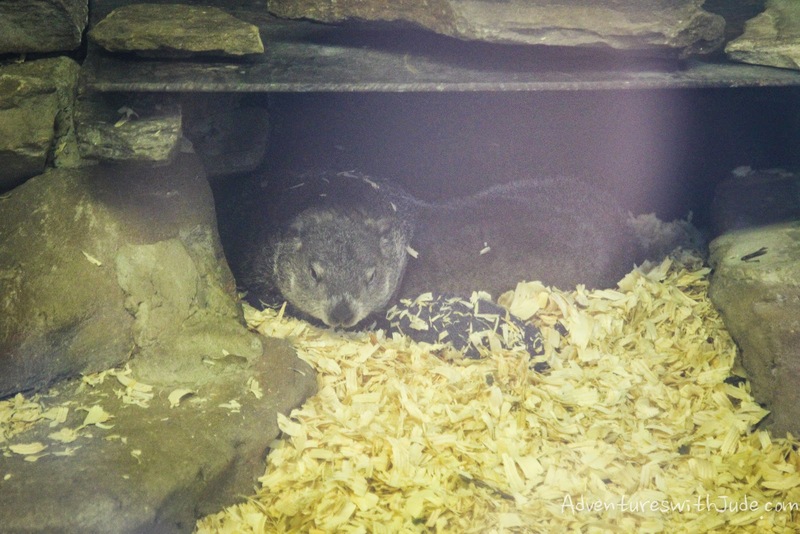 He and Phyllis were settling in for an afternoon snooze, as they had just returned from Gobbler's Knob where he had a meet-and-greet with a bus filled with tourists. There was an "official" Phil statue as well. Of course, we had to take a picture of Brendan and "Phil," who got a turn wearing the Yellow Traveling Fedora. Celia had stayed home with Neal while we did most of our giant trip, because she had school. 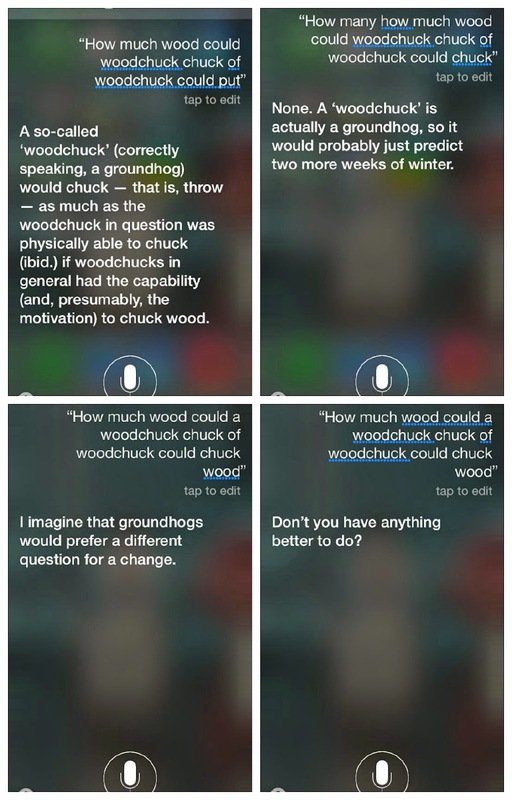 She decided to use an iPhone and Siri to find out about groundhogs. For all that we teased Brendan, it was actually a really fun mid-day visit. We spent about two hours there, but probably could have made an entire day of it by also visiting the Weather Discover Center. (We needed to move on since we wanted to visit the Flight 93 Memorial on our way to hour hotel in Fredericks.) 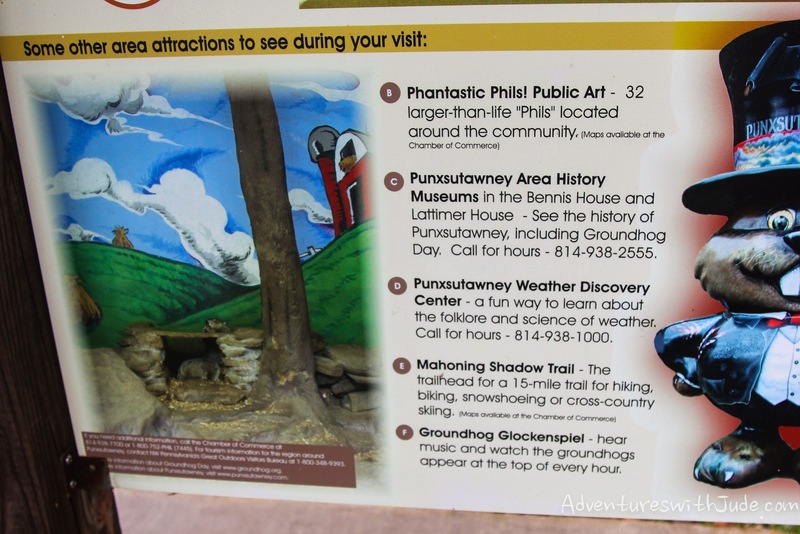 If you have a chance to visit Punxsutawney, go! Yes, it's kitschy, but it's a fun bit of Americana to experience, whether you're traveling across a few states or across the world. What a fun visit! :) Sounds like special memories were made that day.